Minister of Justice and Correctional Services Michael Masutha, President Cyril Ramaphosa and Transport Minister Dr Blade Nzimande. President Ramaphosa chairs the Presidential Working Group on Disability at the Union Buildings in Pretoria. 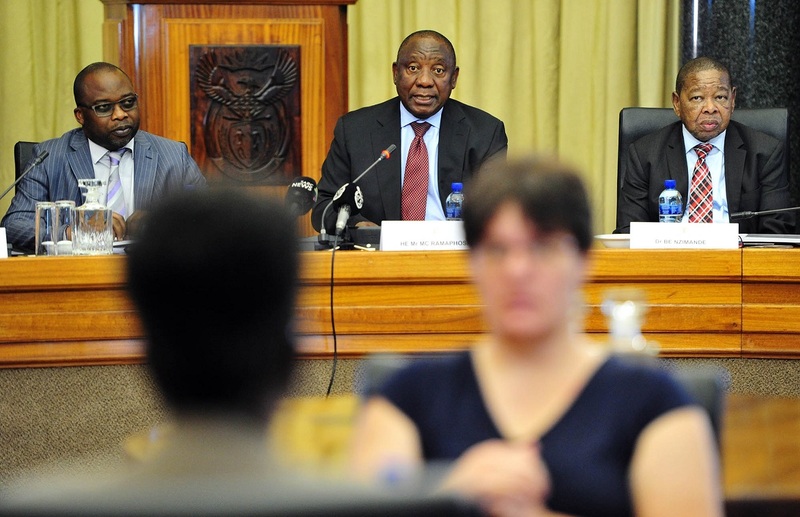 After I received a notification that President Cyril Ramaphosa would be giving an address about disability rights I logged on to watch with interest, writes MAKGOSI LETIMILE. The president mentioned how he had brought together a committee of various arms of society to work together to improved, include and work together with and for people living with disabilities so that we can also be part of the larger, progressive society. Because we can make all the noise about being progressive however until the biggest minority group is included, it all means nothing. As per reports the address was attended by various groups dealing with everything disability related which is wonderful however I worry that the trickle-down effect wonâ€™t reach the ordinary disabled person on the street. Breaking their own constitutional laws of inclusivity, which according to them, 2% of every company should have disabled employees, I have highlighted how mentally disabled people will more likely to be hired because their disability is invisible. However, the working community needs to have a few, if not a lot of people with visible disabilities – Â this would go a long way to educating and enlightening, sensitising them on how we exist. We should not only be seen when we are begging on street corners because disability is expensive and we deserve to live decent lives. Are there places for vulnerable groups anymore? There are estimated 2.8 million people living with disabilities and I know from the various conversations Iâ€™ve had with a lot of PWDs and support groups most of us are unemployed, not because of lack of education or skill but because of prejudice. I want to believe that this committee is not just for show as this is the election year, I donâ€™t know remember the call to the general public asking that people with disabilities show up if they are interested in working with government so I am a bit skeptical. We need to reach people from every corner of the country, especially those who do not belong or run NGOs. The main issue with NGOs is also that most are often formed as a desperate last measure in response to the exclusion we face because companies will not hire people with disabilities however they will make contributions to an NGO as part of their CSI spend. Almost everybody I have told about my terrible experiences when it comes to job hunting has told me to start my own NGO or a business of some sort, nobody tells you how funding for business is hardly ever approved and going the banking route to apply for financing never works because you need to have an asset or two to get funding. When you live on R1,700 a month from government in a care facility or a home with no space you donâ€™t have anything to give the bank as a guarantee. So itâ€™s a vicious, never ending cycle and very few people actively stop to ask â€œwhere are the people with disabilitiesâ€? I shouldnâ€™t be forced to beg or meek out a living trying to run a business without funding because government and the rest of the country is discriminatory, I want to be able to wake up and go to work, integrate with the rest of society until people feeling the need to cringe just because there is a woman out in a wheelchair. So I am volunteering myself to be part of this presidential committee, should they need anymore people with disabilities, myself and many of my friends are here , you said Thuma Mina Mr President and here we are, send us. Makgosi Letimile is a reluctant disability activist trying to get employed.